Quick analysis: Everything is broken. For the first time since Sept 2011, consumer litigation under all of the big three statutes (FDCPA, TCPA, FCRA) are up over the previous month AND up year-to-date. For the month, FDCPA is up +5.4%, TCPA is up +29.8% and FCRA is up +15.1%. This year has been emblematic of an environment where litigation continues to evolve in lurches, keeping us guessing about where it is really headed. With ten months of 2015 behind us, however, the patterns (if not the numbers) seem pretty well set for the year. For the first time in several years, overall consumer litigation is up dramatically. This is thanks in no small part to FDCPA suits unexpectedly catching fire this year, up more than 1200 suits (+14.5%) over this time in 2014. For context, FDCPA was down compared to the previous year at this point in 2014 by -5.5%, in 2013 by -7.6% and in 2012 by -6.9%. 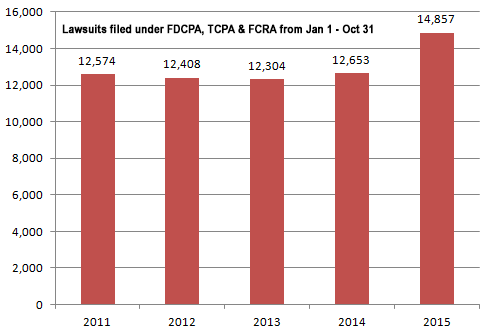 The last time litigation under FDCPA’s grew, in 2011, there was a gain over 2010 of +12.2% at this point in the year. FCRA is doing its part as well, up nearly 800 suits which works out to a dramatic +39% increase over this time last year. It has been up at this point in each of the past four years, +7.5% in 2014, +.5% in 2013, +13.8% in 2012 and +41.8% in 2011. The last time it was down was in 2010, -5.0% at this point in time over the previous year. One statute we cannot give much credit to for the big increase is TCPA. In fact, for much of the year it looked like TCPA – after several years of strong growth – would actually decline. TCPA’s YTD numbers have recovered due to the combination of a strong October and a weak few months at the end of 2014. Now up almost 200 suits (+8.7%) over this time last year, TCPA seems to have avoided the likelihood of a decline. For context, TCPA was up compared the previous year at this point in 2014 by +45.9%, in 2013 by +69.4%, in 2012 by +55.3%, in 2011 by +116.2% and in 2010 – the first year we have comprehensive numbers – it grew +618.9%. So this year’s +8.7% seems pretty anemic by comparison. If you add up all of the instances of litigation filed under the big three consumer statutes over the last five years, you’ll see how consistent the numbers have been (until now). At this point in each of the last several years, the total number of FDCPA, FCRA and TCPA allegations in litigation were in the mid-12,000’s (2011 had 12,574; 2012 had 12,408; 2013 had 12,304 and 2014 had 12,653). This year, we are more than 2200 suits above the highest prior year with 14,857. CFPB complaints against debt collectors plummeted this month, dropping a whopping 19.9% in October. That brings us to a point where we are only 1.7% above last year’s complaint figure. As always, expect this number to go up a few points in the coming weeks as new complaints trickle into the public record, but even so this message seems clear: Barring significant changes in the process, CFPB complaints against debt collectors have leveled out. For October 2015, about 38% of all consumer litigation plaintiffs had sued at least once before under consumer litigation statutes. About 819 different companies were sued, and 703 different debt collectors were complained about to the CFPB. Class actions were high across the board, with 19.1% for FDCPA, 26.1% for TCPA and a low 17.3% for FCRA. The Illinois Northern District Court in Chicago once again had the most litigation filed in it, with 73 consumers represented in litigation there. California had the most CFPB complaints against debt collectors, with 355. Of those cases, there were about 1313 unique plaintiffs (including multiple plaintiffs in one suit). Of those plaintiffs, about 494, or (38%), had sued under consumer statutes before. Actions were filed in 149 different US District Court branches. About 819 different collection firms and creditors were sued. There were 2535 complaints filed against debt collectors from Oct 01, 2015 to Oct 31, 2015. This includes 2368 (93%) timely responses to complaints, and 167 (7%) untimely responses. Of the company responses, consumers accepted 0 (%) of them, disputed 245 (10%) of them, and 2290 (90%) were N\A.